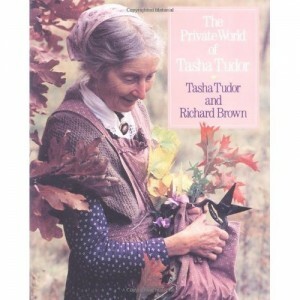 In June’s blog Gardening with Tasha Tudor, I listed books about Tasha Tudor. Here are summaries of those books. Bethany Tudor, Tasha’s eldest daughter, describes what it was like to grow up in the Tudor-McCready family in the 40′s and 50′s. She provides us with details of her family history not offered in other books, such as a more complete picture of Tasha’s father William Starling Burgess who not only designed yachts, but also small planes that he also built, and was a poet and storyteller. 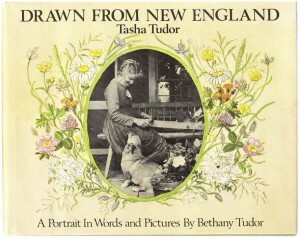 She describes Tasha’s childhood growing up in Aunt Gwen’s home in Connecticut; the bohemian existence greatly influenced the direction of her life. We learn what inspired her to become an illustrator and the difficulty in getting her first book published. We also get an inside look at Bethany’s life growing up in an old house in New Hampshire without running water and electricity with her family raising farm animals and growing their own food. Even though they worked hard as a family, Tasha also made their life almost magical with festivities throughout the year, especially at Christmas, and with activities such as marionette shows and a Sparrow Post with their dolls with miniature cards and catalogs. We learn more about how her love of Corgis began and how they inspired her work. And, finally, Bethany talks about Tasha’s move to Vermont, her life there, and the success she continued to have with her work. The book contains many photographs not found elsewhere. It is a loving tribute to a mother who provided inspiration, creativity, and a work ethic for her children. In this book, we learn about Tasha Tudor, her life and work as the four seasons progress at her home in Corgi Cottage in Marlboro, Vermont. Richard Brown gives an overview of her life in the introduction from her Boston society beginnings, her accomplished parents, her life with her Aunt Gwen that shaped her ideas of what she wanted to do in life, her marriage and children, and her career as an illustrator. The book uses the four seasons as a backdrop to Tasha’s recollections of her life – memories and insights into what she experienced from a very early age to the present. It also allows the reader to see how she lives at Corgi Cottage from her love of the 1830′s with her collection of antique clothing and implements, to gardening and to her pets. We see her spinning and weaving, and learn more about her fascination with dolls and how she created a world around them that her children could enjoy. The book is like a personal visit with Tasha at her home, listening to her memories and philosophy on life, seeing how she lives, and experiencing some of the magic of the life she’s created. This book reminds you that the best meals are simple and basic and made with love. 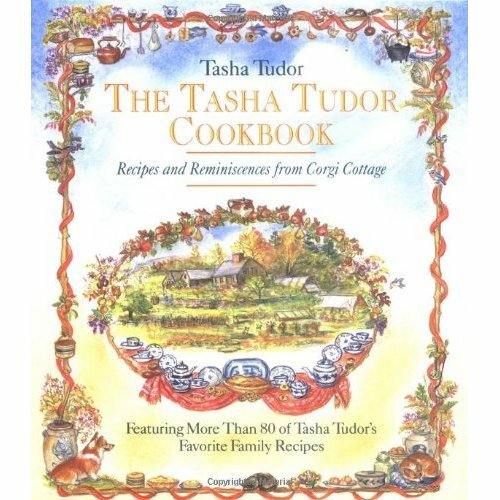 It’s wonderful to see the recipes (or “receipts”) that are referred to in the books about Tasha Tudor such as roast chicken and mashed potatoes, and the New Year’s dinner of roast beef and Yorkshire pudding. It includes how to roast a turkey in a tin kitchen; although most of us don’t cook in a fireplace or have a tin kitchen, it is still interesting to read how it’s done. Of course, the book wouldn’t be complete without her Scottish nanny’s Dundee cake and hot cross buns. 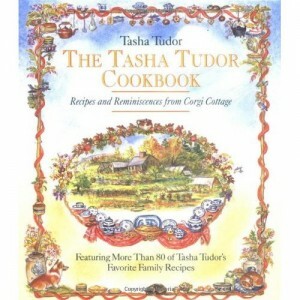 Each recipe in the book is introduced by Tasha with stories of how they came to be and advice on cooking the dish. 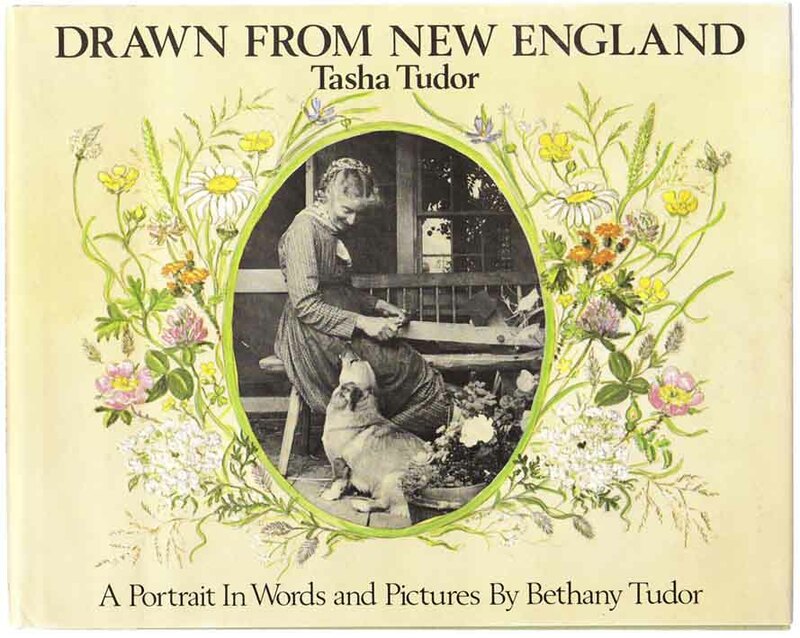 Tovah Martin was a friend of Tasha Tudor and visited her many times at her home in Marlboro, Vermont. She describes Tasha’s home and goes through the seasons with Tasha in her garden, letting Tasha talk about her ideas and stories about gardening. Although Tasha says she did not plan her garden, a structure is evident with the terraces providing support and boundaries within which Tasha creates and changes garden areas as she goes along. Coming from a long line of gardeners, Tasha avidly seeks out heirloom seeds and plants. In spring, her garden is awash in all types of bulbs especially daffodils and tulips along with the blue forget-me-nots. She loves primroses and plants seeds in the fall to enjoy plants in the spring. In June, the azaleas, bluebells, her mother’s lettuce poppies, “bomb type” peonies, and many roses set the stage for summer solstice with a Midsummer’s Eve party held in her lupine meadow. Tasha works hard but has help from family and friends with whom she’ll enjoy her daily ritual of tea time; later in the day she sketches in the garden. There’s a rhythm to her day that includes milking the goats and taking care of her animals. 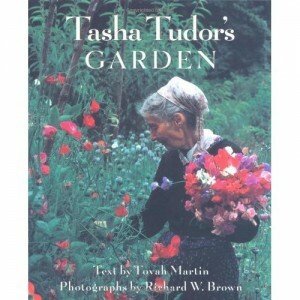 We learn about her secret garden as well as her secrets for growing lush flowers and vegetables (such as manure tea). Her meadow is filled with wildflowers featuring lupine, daisies, lavender rocket, black-eyed susan, and echinacea. She makes all sorts of wonderful treats from her fruit trees and berries. In the fall, we see her harvesting and storing potatoes, her favorite, and other root vegetables as well as drying herbs and planting yet more bulbs to welcome the spring. 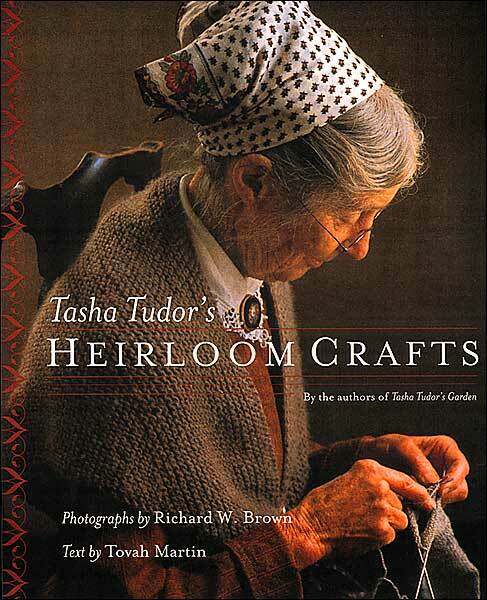 This book provides an overview of the tasks and activities that Tasha performed daily to live the 1830′s lifestyle she so loved ; the word “crafts” was used in the title for want of a better word. We learn more about the 1740 farmhouse that her son Seth built for her and its contents; that everything in the house has a purpose including chests, buckets, utensils, as well as baskets she’s made for vegetables and laundry. Tovah is by her side as she shows her what she does each day over the course of the changing seasons: gardening, weaving fabric, washing, dying, and spinning wool, taking care of her chickens and goats, cheese making, candle making, soap making, cooking on the woodstove, cider making, preparing for Christmas and Easter, quilting, dressmaking, and doll making. 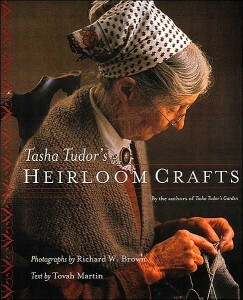 This is not a how-to book, but rather a look at the skills that Tasha has cultivated over the decades. In the course of showing the activities she so dearly loves to do, she talks about her life, her way of living and how it has evolved. Richard Brown captures in photos what Tovah so beautifully describes in text. There’s even a beautiful photo of the blue Canton tea set that Tasha often talked about and has been in her family for centuries. 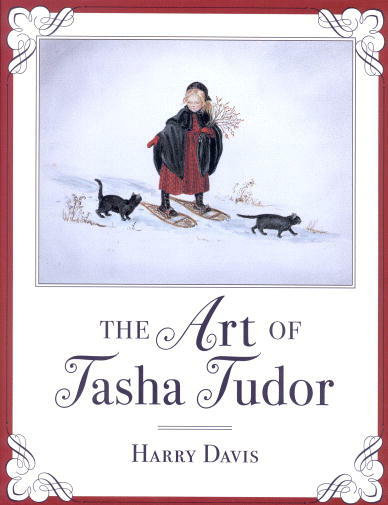 Harry Davis, who studied art, became Tasha Tudor’s business partner in the 1980′s. He provides a detailed picture of her life from childhood to adulthood, including her marriage to William McCready and their four children. This personal background gives the reader a better understanding of not only the spirit at the core of her being, but also the challenges that life brought her and how she met them. As he is an artist also, he gave an insightful overview of her artistic development from her early art education to her career as an illustrator and author. At the same time, he describes her life in the 40′s and 50′s that she led with her family and inspired so many of her works. She enjoys her new freedom in the 1960′s with her children grown and having divorced McCready. Her creative endeavors continue with her move to Vermont in 1971 where she lived the 1830′s life she dreamed of, caring for her animals, particularly the Corgis, that permeated her later works. 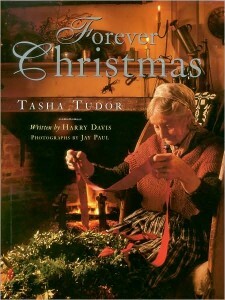 Although this book was not sanctioned by Tasha Tudor because of an acrimonious parting with Harry Davis, it nonetheless offers a view of Christmases celebrated by Tasha Tudor and her family. Harry Davis, who has treasured his Tasha Tudor Advent calendar since he was a child, takes us through the Christmas season with Tasha revealing the rituals and activities of the season that makes the season magic for her and others. Starting with the boxwood Advent wreath that Tasha has made for decades, we see her lovingly weave through it a red satin ribbon that adorned the pews at her parents’ wedding. On St. Nicholas day (December 6), she celebrates with an Advent tea featuring Dundee cake, a recipe from her Scottish nanny. She tells how she and her children would start making gifts in the summer – all gifts given are handmade; she talks about the gifts that were special to her as a child. Harry describes her fascination with snow from a child making snow horses with her friend Rose to making snow lanterns later in life. Then there’s the gingerbread ornaments for which she is famous, having made them for the White House. She doesn’t forget the animals at Christmas, hanging doughnuts on trees for the birds and giving treats to chickens, goats, Corgis, and parrots. It all culminates on Christmas Eve when they make a candlelit trek through the woods to the creche on the stone ledge. Christmas day we see the preparations for dinner featuring turkey roasted by the fire in a tin kitchen that has been in Tasha’s family for generations. The day ends with the lighting of the candles on the Christmas tree adorned with ornaments going back to 1858. There’s much more to discover in this book whose photos of her preparing for Christmas and illustrations from her books are exquisite.